The highly anticipated Jessica Rabbit Dancing series was released today at the Disney Soda Fountain Studio Store, and it was released along with a surprise pin as part of the series. There are reports of people camping out late last night in front of the store for a chance to get these pins. The Swing, Waltz, and Paso Doble are jumbo pins, each a LE 300 and sold for $18.95. 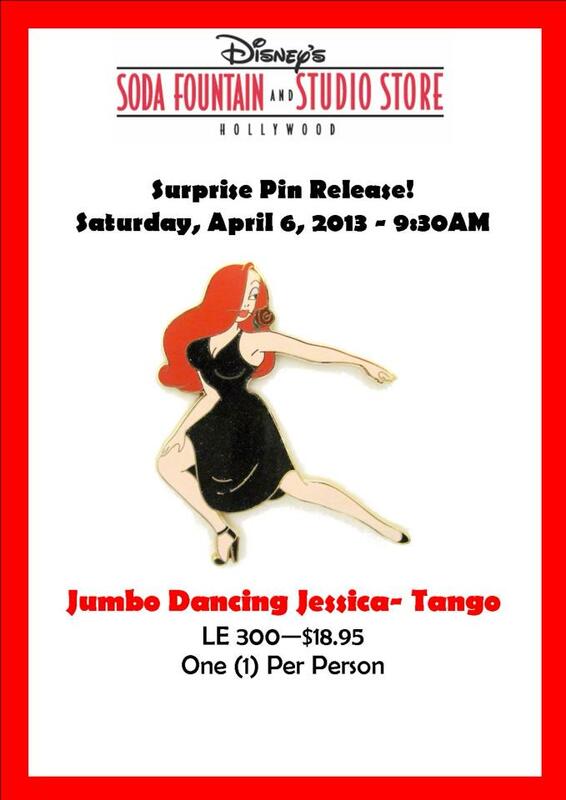 The Surprise Jessica Rabbit Tango pin is also a jumbo pin, though bigger than the other three, is an LE 300 and sold for $18.95. The Paso Doble, Waltz and Tango pin all feature glitter filled dresses. It's also worth mentioning that the pins of Jessica alone seemed to be the more desired of the series. Poor Roger!